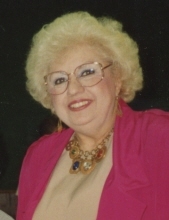 Anne Joan Pociask, of White Lake Twp., MI, died on April 7, 2019. She was 96 years old. She is survived by her son, David (Diane) Pociask; grandson, Brian (Sarah) Pociask; great - grandchildren, Alex and Silas Pociask; niece, Vivian (Bob) Drewa, as well as many extended family members and dear friends. Anne was preceded in death by her sisters, Dolores Songalewski and Sister Mary Redempta. Visitation will be held at Lynch & Sons Funeral Home, 404 E. Liberty St. on Friday, April 12, 2019 from 2:00 - 8:00PM. Rosary 6:00PM. Funeral Service at Church of the Holy Spirit, 3700 Harvey Lake Rd., Highland, on Saturday, April 13, 2019 at 11:00AM with gathering beginning at 10:00AM. Burial Holy Sepulchre Cemetery, Southfield, MI, 1:15PM. "Email Address" would like to share the life celebration of Anne Joan Pociask. Click on the "link" to go to share a favorite memory or leave a condolence message for the family.